Collection of research papers “South archive (philological sciences)” is a journal of philological focus area founded in 1998. 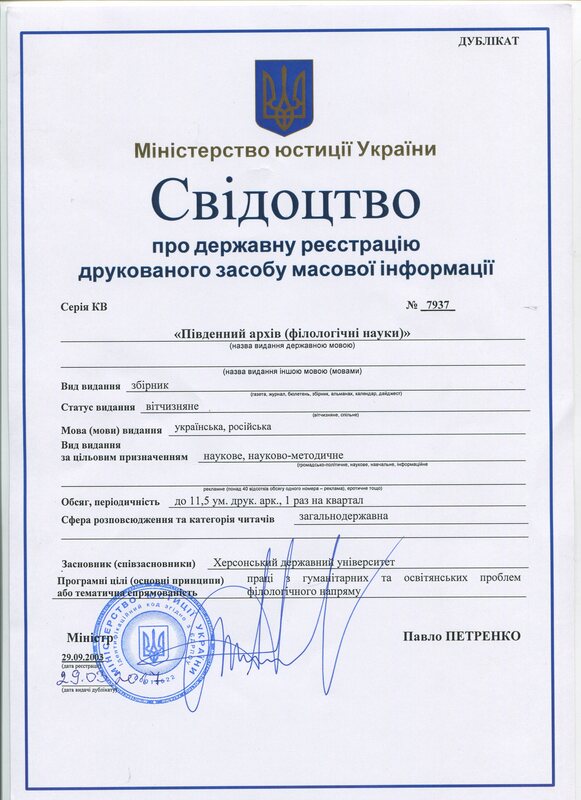 Collection of research papers “South archive (philological sciences)” is a professional edition according to the Order of the Ministry of Education and Science of Ukraine No 1604 dated 22.12.2016 (annex No 9). The collection is posted on the website of Vernadsky National Library: “South archive (philological sciences)”. The journal covers the current issues of Slavic and foreign philology, literature studies, linguistics, translations studies, comparative literature. The editorial board carries out external and internal reviews of all received articles. The editorial board of the collection includes leading Ukrainian and foreign scholars. The journal cooperates with the best Ukrainian and foreign HEI, public and local authorities. Such cooperation involves publication of information materials and scientific articles, performance of round tables at the premises of the journal office. The collection contains scientific-theoretical and practical materials on topical general-theoretical and branch philological issues. We invite all those who wish to collaborate with our journal and offer you to print your articles. This journal is intended not only for scholars, but also for practitioners, who will find a lot of useful information for their activities.